I use the Custom Creations in 060 Deep. What I like about this foundation is that it works great by giving a nice light coverage. What makes this product one of "my favorite things", is that it creates "custom" shades. In the summer, I tend to be outside A LOT, whether it's working out, taking my son to the park or pool, or whatever--I get really tanned. Instead of having to go out and spend more money on a darker shade of foundation, I just click my Custom Creation to a darker shade. As autumn and winter come up on us, I'll eventually click back to a lighter shade. I think this is really convenient and am surprised other make-up companies haven't thought of this. The only downfall, is that the 060 Deep seems to be the darkest shades that is made in this line. 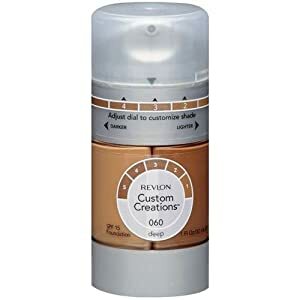 I consider my skin color to be a light brown shade that gets a darker medium brown during summer, so my only complaint is that Revlon has seemed to have left out my darker skinned sistas. Maybe if this line gets more popular, they will expand the shades. Also, I use this foundation to make my own tinted moisturizer. I basically mix (70/30) of my favorite facial moisturizer with this foundation. Works great! Nice! I'm going to have to look into this!